A lot of Jewish kids get incredibly excited about Purim. But in my own household growing up it wasn’t a big deal. My strongest — and indeed my only — childhood memory of Purim is when Rabbi Frishman of blessed memory read the scroll to us in Hebrew school. As you probably know, Haman is the guy in the Book of Esther who tried to kill all the Jews. So when the book is read aloud at Purim, you’re supposed to make noise, and that, like everything else in Judaism, requires another explanation that we don’t have time for here. Anyway, Haman is mentioned in the Book of Esther some fifty times. But we probably heard it less than a dozen times, because whenever Rabbi Frishman came to the word “Haman” we made so much noise, for so long, that he got annoyed and sent us back to class. I was surprised, because the rabbi was a patient man, and in all my years at Rockland County’s Temple Beth El, it was the only time I ever saw him even in the vicinity of anger. Mostly though I was disappointed, because we didn’t get to my favorite part — when Haman gets hanged. As you may have garnered from the above anecdote, my Jewish education wasn’t rigorous. So as an adult, whenever I am unsure about some aspect of Judaism, I make sure to read about it (a salutary habit that was reinforced as a LABA fellow). With Purim rolling around, I wanted to share the story with my own son, but I figured I’d better read the whole megillah again to make sure I got it right. As you also know, it’s the story of the Persian king Ahasuerus. When his wife, Vashti, disobeys him, he does as powerful men do and finds a younger, more docile woman — in this case Esther, a Jewish beauty. Esther’s cousin Mordecai hangs out by the palace gates to keep track of how she’s faring. When the king’s advisor Haman passes, Mordecai refuses to bow, presumably because a Jew bows to no one but God (remembering this would have saved Michael Cohen a lot of tsuris). So Mordecai decides to kill all the Jews. Esther finds out about the plot and asks the king’s permission for the Jews to slay their enemies; the king, who is sweet on Esther, agrees. 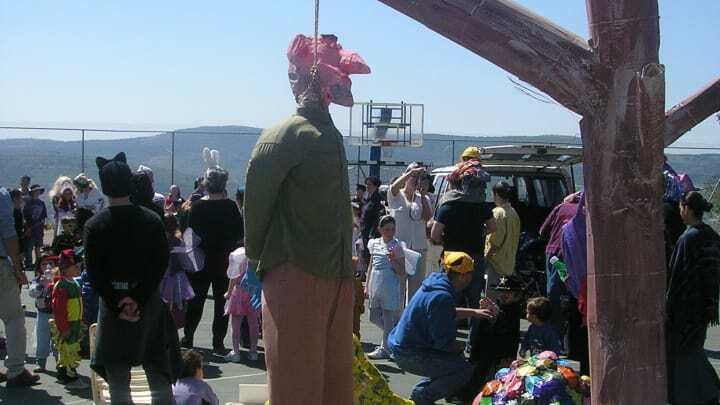 Haman goes to the gallows he had intended for Mordecai, and everybody’s happy. The first thing that struck me after re-reading the Book of Esther was that there’s a ton of drinking. It begins with a 180-day banquet, during which everybody gets hammered. Vashti’s undoing stems from this drunkenness — when the king summons her “to show the people and the princes her beauty,” she refuses to come. Of course she does — who wants to be paraded around before a roomful of drunken courtiers? Haman and Ahasuerus “sit down to drink,” presumably wine, after the advisor maneuvers a royal decree to kill every last Jew in Persia. 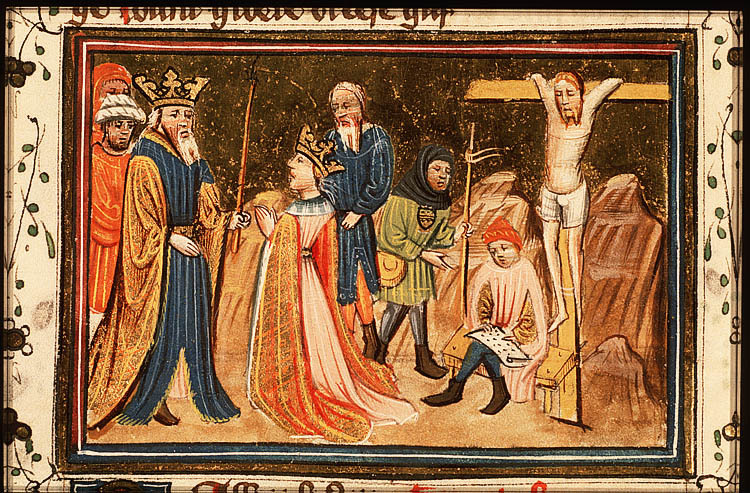 Esther herself has a two-day “banquet of wine” which helps her manipulate the king into sending Haman to the gallows. The Jews, however, don’t do much overt drinking in the megillah. Even after the tables are turned on Haman, the Jews celebrate with “feasting and gladness.” It’s probably safe to assume that wine was available, but it seems obvious that drunkenness is de-emphasized — an echo of the common stereotype of alcohol not being our thing. Long after the Book of Esther was composed, Talmud declares that: A person is obligated to drink on Purim until he does not know the difference between “cursed be Haman” and “blessed be Mordechai.” I assume that the rabbis intended some lesson in ethics and deportment; I think it’s also safe to assume there’s an unspoken desire to enjoy an evening of aristocratic licentiousness. The second striking thing about the megillah is that it ends in a bloodbath. It’s like when you read the pre-Disney, Grimm version of Cinderella and learn that her sisters get their eyes plucked out. Because the Jews don’t merely get revenge on Haman. They send his ten sons to the gallows. They slaughter eight hundred men in the capitol, Shushan. They kill 75,000 in the provinces. There is a suggestion of restraint, because the king has granted permission to kill “both little ones and women, and to take the spoil of them for a prey” (Esther 7:11). But the women and children were spared, and the megillah takes pains to point out that the Jews did not take the spoil. Still, this moment of Jewish triumph seems less like salvation and more like a purge. It’s like Jewish Game of Thrones. The brilliant translator Robert Alter has suggested that the Book of Esther can be read as political satire. And it is true that the king’s drunken mood swings are pretty funny. It’s also a cracking good story, filled with vivid characters and reversals. For me, it’s particularly interesting to explore ideas of Jewish solidarity, Jewish weakness and Jewish power. I’m reminded also of the triumphalism of apocalyptic writings, the mass death envisioned before the World-to-Come by the prophets. I’m sure our forebears found it extremely satisfying to read about their enemies hanged and put to the sword. I’m sure there are plenty of folks who get a kick out of it today. And don’t get me wrong — I ain’t losing any sleep over Haman. Nor should we forget the injunction to hate the Amalekites. But to me, the most striking thing about the Book of Esther is what it lacks — the Jewish quality of rachmunes, or mercy.